True or False Pope: WHY BISHOP SANBORN REJECTS THE PAPACY OF JOHN XXIII – YOU WON’T BELIEVE THIS! 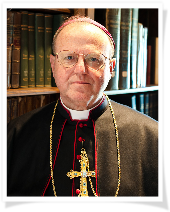 WHY BISHOP SANBORN REJECTS THE PAPACY OF JOHN XXIII – YOU WON’T BELIEVE THIS! OF JOHN XXIII – YOU WON’T BELIEVE THIS! In a 2009 interview, Sedevacantist Bishop Donald Sanborn explained why he rejects the papacy of John XXIII. Was it because he believes Cardinal Angelo Roncalli (John XXIII) was a secret Freemason? Nope. Was it because he believes Roncalli was a Judaizer or a sympathizer with Communists? Nope. Was it because he believes Roncalli was a heretic prior to his election? Nope. Was it because he believes John XXIII fell into manifest heresy after being elected and thus ceased to be the Pope? Nope. Why, then, does Bishop Sanborn claim John XXIII was not a true Pope? Believe it or not, Sanborn teaches publicly that John XXIII was not a true Pope because he personally believes, based on “hindsight,” that John XXIII had the “intention” to call a council for the purpose of undermining the Faith. You read that correctly. No pre-election heresy. No post-election heresy. No secret societies. No public defection. Rather, Sanborn claims that John XXIII’s alleged mere intention alone – and judged, of course, by Bishop Sanborn - prevented him from being a true Pope. Now, we have spotlighted some bad Sedevacantist arguments over the past month, but this argument must rank at the top of the list. And it comes from a Sedevacantist bishop who runs a Sedevacantist seminary! We can only imagine (actually, we probably can’t) what kind of theological training those unfortunate seminarians are receiving. In this article, we are going to quote Sanborn directly and then analyze his position based on what we have previously discussed, concerning Fact and Law. The following is from Sanborn’s 2009 interview with Stephen Heiner. We should note at the outset that not all Sedevacantists hold that John XXIII was an antipope. Fr. Cekada, for example, called in to Catholic Answers Live several years ago and, when pressed, admitted that he is not “certain” if John XXIII was a true Pope or not. This dispute within Sedevacantism is probably why Heiner asked some of the questions the way he did. Now to the interview. Heiner: So then, to go back to the root, do you dispute that [Vatican II] was an ecumenical council? Bp. Sanborn: Yes. I don’t dispute it; I deny it because Paul VI and John XXIII were not true popes. Heiner: At the time that they called the council? Heiner: So you dispute that John XXIII was a true Pope at the time of the calling of the council [in 1961]? Bp. Sanborn: I even deny it. I don’t dispute it. The reason I do is because of his intention, his obvious intention, to alter the fabric of the Faith through the instrument of an Ecumenical Council. Although I don’t think that the case of heresy against him is the same as it is against Paul VI, John Paul II and so forth, nevertheless I definitely think he fails to be a true pope for the reason of his obvious intention to alter the Catholic Church in the direction of Vatican II. Heiner: But doesn’t the Church always say we’re not supposed to judge personal intentions? Bp. Sanborn: No, the Catholic Church does not preach that. You are presumed to have a guilty intention by the commission of an act, whatever it should be, or at least a deliberate intention. Let’s use that word, the deliberate intention by the commission of an act. If you did not have a deliberate intention for some reason the burden of proof is on you. Heiner [presumably in shock over the bishop’s statement]: I’m sorry, so let me rephrase that. So you would concede that the act of calling an ecumenical council doesn’t betray a specific bad intention. Bp. Sanborn: No. In hindsight, though, as we look back upon Vatican II and what happened as a result of Vatican II and look at John XXIII, it is clear that his intention was to alter the Church in the direction of Modernism and that intention vitiated his own authority. It is difficult to know where to begin in analyzing such an absurd and utterly nonsensical argument (and, again, from a bishop who runs a seminary). Let’s start with Sanborn’s explanation for why he believes himself justified for judging the “intention” of John XXIII. Sanborn claims that we can presume a guilty intention when someone commits an act, “whatever it should be.” Notice, he doesn’t say when they commit an objectively sinful act; just when they commit an act, period. That would mean we could always judge a person to have a guilty intention for committing any act. What in the world kind of nonsense is this? Where did Bishop Sanborn learn such a ridiculous teaching? Therefore, presuming that a Pope who called a council had a sinful intention to undermine the Faith is about as whacky a thesis as one could posit. The fact that Bishop Sanborn was unable to detect, at a minimum, the obvious flaw in his argument - that is, his failure to distinguish between an objectively sinful act and a perfectly licit act - is quite telling, since it gives us a glimpse into the extremely confused mind of the Sedevacantist bishop. Next, Sanborn argues that the alleged and unprovable “bad intention” of John XXIII (which Sanborn rashly presumes) hindered him from becoming a true Pope, even though he was elected by the Conclave and accepted by the entire Church as Pope. Where in the world did Sanborn get this idea? When has the Church ever taught such a thing? We don’t think it’s too harsh to say that Sanborn’s teaching is pure insanity. Sanborn claims that John XXIII’s alleged evil “intention” can be discerned “in hindsight,” if “we look back upon Vatican II and what happened as a result of Vatican II.” But such a rationale is completely absurd for many reasons. First and foremost, Sanborn has no authority to establish the alleged “facts” of John XXIII’s “intentions” in the ecclesiastical forum, since that authority belongs to the Church alone. Second, what Sanborn personally discerns “in hindsight” (and the false conclusion he derives from it) is negated by the fact that a Pope who has been peacefully and universally accepted by the Church (which is certainly the case with John XXIII) is a true Pope; and this is a fact about which we have infallible certitude, according to the common opinion of the theologians. Third, even if Sanborn were the judge of the Pope’s “intentions” (thank God he is not), he certainly couldn’t prove that John XXIII intended to “alter the fabric of the Faith,” as if that were even possible. In fact, one could argue his intentions were just the opposite, for in John XXIII’s opening address to the council, he said: “The major interest of the Ecumenical Council is this: that the sacred heritage of Christian truth be safeguarded and expounded with greater efficacy.” While more could be said, for all intents and purposes, it could easily be argued that Pope John had nothing but good intentions for the council. It has also been reported that, on his deathbed, realizing that the Council was heading in the wrong direction, John XXIII said: “Stop the council! Stop the council!” For these and many other reasons, Sanborn’s accusations against John XXIII, who didn’t even live to see the final drafts of the conciliar texts, much less their ratification by Paul VI, are as absurd as they are highly insulting to the Vicar of Christ. We will now go a step further and apply what we have learned in previous articles, about Fact and Law, to Sanborn’s crazy theory for why John XXIII was not a true Pope. Questions concerning how a Pope would lose his office, or what would prevent a man from being validly elected to the papacy, are speculative questions of law and theology, which the Church alone has the authority to decide. Whether the man elected to the papacy met the necessary conditions (established by law) to be validly elected, are questions of fact, which are also established in the ecclesiastical forum by the Church alone. The Church (not individual Catholics) establishes the facts of a case, and then applies the facts to the applicable law, whether it is Divine law or ecclesiastical law. Now, whether a “bad intention” would prevent a man from being elected Pope falls into the category of a question of law; and, needless to say, there is no such law on the books. Neither has any Church-approved theologian or canon lawyer ever taught that a Pope who intends to undermine the faith automatically loses his office (or would be prevented from obtaining the papacy), based upon the personal judgment of his intentions by private individuals (not the Church). Sanborn, of course, created this “law” out of thin air in order to justify his Sedevacantist position. Second, even if there were such a law on the books (which there’s not), the Church alone would be the competent authority to determine if the bad intention (the “fact”) were present. The establishment of such facts in the ecclesiastical forum is certainly not left to individual Catholics in the pew or vigilante bishops and seminary rectors who place themselves above the law by presuming a guilty intention when someone commits a perfectly lawful act. What’s most ironic is that Sanborn himself has admitted that individual Catholics have no authority to settle speculative questions of theology and law that have not been resolved by the Church. You read that correctly. When Sanborn was a priest in the Society of St. Pius X, he and eight other priests wrote a letter to Archbishop Lefebvre complaining they were not permitted to question the validity of the New Mass and the new rite of ordination. They claimed that these issues were “speculative questions of theology” that “the Church alone” must resolve “in an authoritative and definitive fashion” (evidently, the Church’s approval of the new rite of episcopal consecration did not suffice as an authoritative resolution for Sanborn and his colleagues). But by creating a novel legal/theological theory which holds that a mere intention to harm the faith (discerned by private judgment) causes a Pope to lose his office (or prevents him from receiving the papacy), Sanborn has gone well beyond usurping the Church’s authority to definitively settle speculative questions of law and theology, since no such legal or theological theory in Church teaching even exists. It is the invention of the confused mind of Donald Sanborn, who has made himself not only the judge and jury of the Pope, but the lawgiver as well. This is the typical hubris one regularly finds with Sedevacantist laity and clergy. And if personally assuming to settle speculative legal and theological questions “is dangerous and opens the door to great evils,” as Sanborn claimed in his letter, how much more evil is it to reject a Pope, based on a non-Catholic theory that one has created for himself, to justify his rejection? Did we mention that Sanborn is the rector of a “Catholic” seminary? In short, every single point that Sanborn made for why John XXIII was not a true Pope was utterly and completely erroneous. First, he presumes a bad intention, even though the act was good in and of itself. In this, Sanborn has committed the sin of rash judgment, which, due to the gravity of the matter at hand, is almost certainly mortal sin. Second, he invents the “law” that a bad intention (intention to harm the Faith) would prevent a man from becoming a true Pope, which may be the teaching in Sanborn’s renegade seminary in Brooksville, Florida, but it is not the teaching of the Roman Catholic Church. Third, he treats his sin of rash judgment as if it were an established fact, and then reasons his way, via the law he invented, to the conclusion that John XXIII, who was elected Pope by the Cardinals and accepted as such by the entire Church, was not a true Pope. His conclusion, which he publicly professes, is an objective mortal sin against the Faith, as we will explain in a moment. Before doing so, here is the syllogism of Sanborn’s theory. Major: If a man has the intention to harm the Faith, his bad intention will prevent him from being elected as a true Pope. Minor: Sanborn personally thinks Roncalli (John XXIII) had the intention to harm the Faith. Conclusion: John XXIII was a false Pope. As we see, when the entire Church accepts a man as Pope, we have infallible certitude of his legitimacy; it is a dogmatic fact which cannot be questioned – that is, not without falling into mortal sin. In his 1951 book On the Value of Theological Notes and the Criteria for Discerning Them, Fr. Sixtus Cartechini, S.J., explains that the rejection of a dogmatic fact is a “mortal sin against faith.” And the example he uses of a dogmatic fact is the legitimacy of a determine Pope (Pope Pius XI). Now, since Bishop Sanborn teaches that one must presume an evil intention when someone commits a (sinful) act, then, according to his own reasoning, he is presumed to be guilty of a mortal sin against the Faith, by denying that John XXIII was a legitimate Pope. And he is presumably leading his seminarians at Most Holy Trinity Seminary into the same mortal sin against Faith. Bishop Donald Sanborn makes a mockery out of the Catholic Faith and the episcopal office itself. He should be shunned by all true Catholics. John XXIII announced that he would be calling the council on January 25, 1959, but did not formally do so until December 25, 1961. Humanae salutis. http://www.ewtn.com /vatican2/ideaForCouncil.asp. Msgr. Van Noort, Christ’s Church, p. 112 (emphasis added). Louis Billot, S.J., Tractatus de Ecclesia Christi, 3rd ed. (Prati: ex officina libraria Giachetti, 1909), pp. 620-621.